An active 7 year old was killed on Christmas Eve, when a teenage drunk driver crashed into the family car.It was 5 pm when Jenny and her family were on the road to go to grandma’s house for Christmas. They were approaching the intersection of highway 169 and highway 19 when they saw a pickup truck speeding towards them. The seventeen year old driver had run the stop sign, bounced the speed bumps and was racing head on towards their car. Jenny’s dad had no where to go to avoid the oncoming crash since snow was pilled up on both sides of the road. They were hoping that the pickup would speed past, but then he heard and felt the crash right behind him, where his two children were buckled in their car seats. 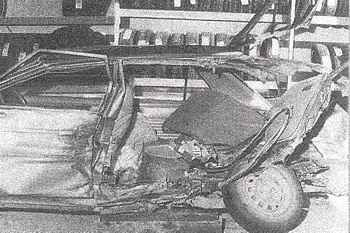 Jenny took the brunt of the crash because she was seated behind her father. Her car seat was pushed to the middle of the car which resulted in her five year old brother being face to face with his beloved sister who had lost her face beyond recognition. Her brother will always remember that moment and the sight of his dead sister. He will now grow up without his best friend, his sister Jenny. Her father has stated that they were so careful to always wear seatbelts, but in this case, it could only save three of them. The boy that killed Jenny had an alcohol content of .19, and he was illegally served alcohol. Now the teenage drunk driver, who tried to flee the scene, must live with the fact, as will her family that her death was the result of his decision to drink and drive.